Easily discover apps and data that will work with your ArcGIS online account. ArcGIS Marketplace is a new website that allows ArcGIS Online subscribers to search for, discover, and get apps and data from qualified providers. Need some high-quality data? The Marketplace offers premium data from organizations such as AccuWeather, DigitalGlobe, RapidEye, and Esri. How about an easy-to-use app that answers a specific business need? The Marketplace includes a range of apps from Esri and its distributors, as well as partners such as Azteca Systems, con terra, Eagle Information Mapping, Galigeo, GeoData+ GmbH, and Latitude Geographics. The apps are built specifically to work with ArcGIS Online and can easily be shared with ArcGIS Online groups and users within your organization. Anyone can browse the listings in ArcGIS Marketplace, but you need to be an ArcGIS Online subscriber to get free trials or make purchases. Because all apps in ArcGIS Marketplace require an ArcGIS Online login, users can access their organization’s maps via the apps. Data services acquired via ArcGIS Marketplace are also accessible via ArcGIS Online, so you can add them to your basemap gallery or other apps. 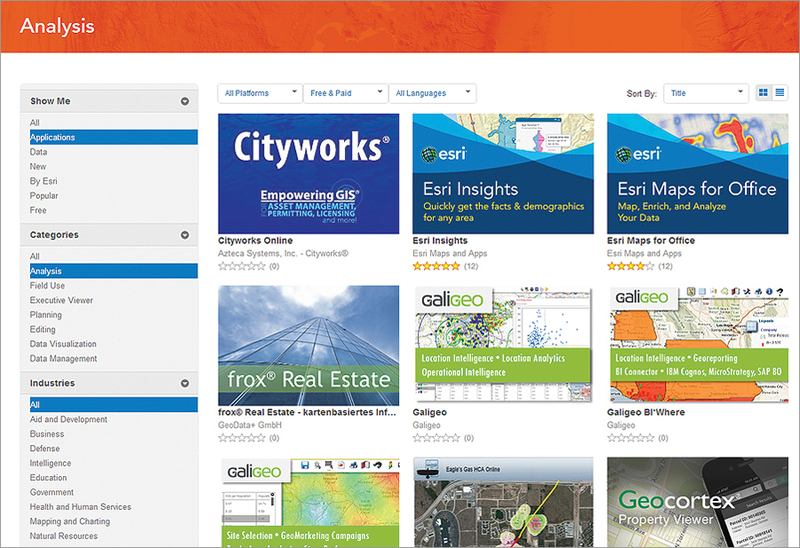 For apps and data service providers, ArcGIS Marketplace provides a mechanism to provide free trials, grant access to listings, manage subscriptions, and generate leads. ArcGIS Marketplace is available globally. Keep checking in over the coming months, as the number of app and data listings will grow rapidly.